During your time at ManTech, has the company changed? If so, how? I came to ManTech through an acquisition in 2010. During the past 8 years, we have really grown – not just in size, but in and talent, and we are recognized for the outstanding support we provide to our customers. After I retired from the Marine Corps after serving for little more than 22 years, I was a police officer for four years. During that time, I saw both the best and the worst that our society has to offer. Technology. It lets me be away from the workplace and still be connected when required. Most importantly, technology can readily be switched on or off, letting me determine who can contact me and when. Get as much formal education as you can before joining the job market. Education can be a four-year degree or professional/technical certification. And stay out of trouble so that you will qualify for a security clearance. This is a great place to work. ManTech lets each employee realize their full potential. The company offers education, lateral transfers, great salaries and exceptional benefits. 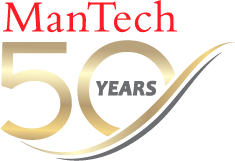 If I were starting over in life, ManTech would definitely be on my list of candidate companies. On my boat with my wife in the Gulf of Mexico fishing for redfish and spotted trout. I manage several contracts with more than 225 employees. The coolest thing about what I do is seeing how the teams that we put together to support the government and how they come together and have fun doing a great job supporting the customer. Securing the future to me has three elements. First is the customer – Ensuring that ManTech takes all the steps to ensure we complete the mission assigned to us each and every time. Second is ManTech – Supporting proposals and business development to ensure ManTech has access to contract vehicles that will ensure our company’s growth. Third is me – Ensuring that I am doing the things financially, educationally and personally that will give me the longevity I need to enjoy both my time at ManTech and retirement.